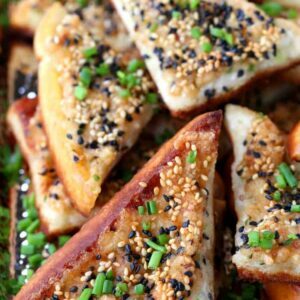 This Bacon Shrimp Toast is so good, you’ll never order it from take out again! It’s a surprisingly easy appetizer to make and crazy delicious! Bacon…everything is better with bacon. As much as I loved the flavor of shrimp toast the first time I tried it, I knew I could make it taste even better. We had a last minute get together a couple of weeks ago. One of those times that you throw something together at the last minute and it turns into a full blown party. That does seem to happen a lot at my house…can’t explain it. We just have fun friends who come when I call! They know I’m going to have some good drinks, great food (it was Upside Down Pineapple Chicken that night) and lots of music. But like I said this was a last minute thing so I did rely on a couple of my friends to bring some of the food. Yeah that’s me, calling you up asking you to come over and hey…bring whatever you got in your freezer to fill in! Some brought drinks, some brought food. It all worked out with what we had on hand, no one had to run out for anything. So one of my neighbors brought shrimp toast. I had never tried it before – so I grabbed a few for my plate when they came around. Crispy, fried shrimp toast with a duck sauce for dipping. 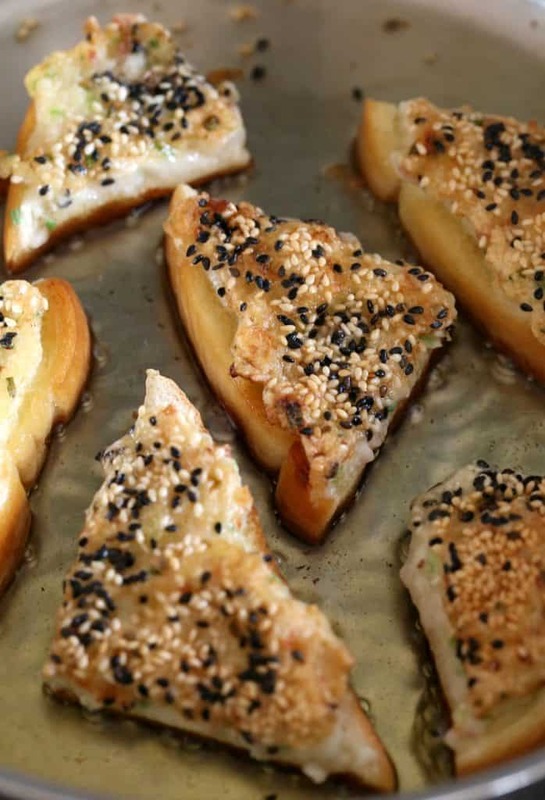 Shrimp Toast are small triangles of white bread brushed with egg and coated with chopped (minced) shrimp. The triangles are then lightly fired until crispy. 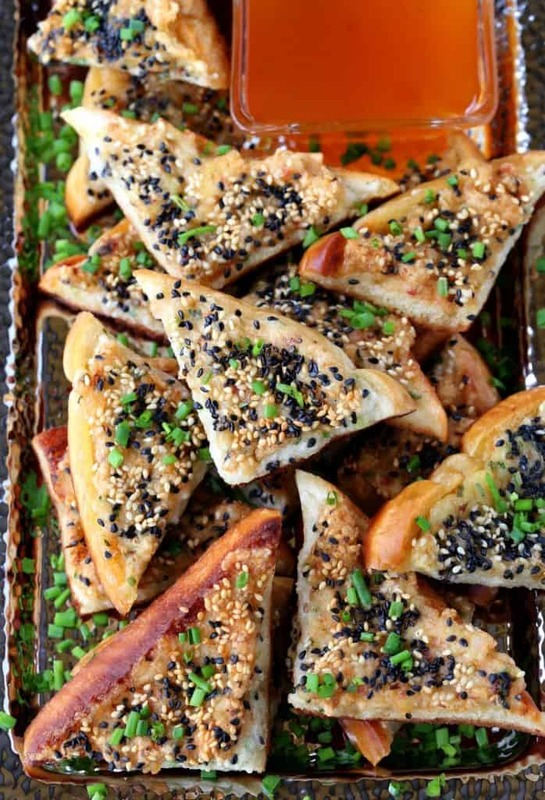 These appetizers are typically served as part of Chinese Dim Sum. We kicked this appetizer recipe up by adding bacon too. Because bacon rules. So you guessed it, I had to put my own spin on this bacon appetizer to make it even better than the way I first tasted it and that’s how this Bacon Shrimp Toast happened. Googling recipes on shrimp toast led me to one recipe that seemed like it was a pretty authentic…why did it seems authentic? Don’t know, but the first ingredient was pork fat. And now they had my attention. Because that’s the thing, that’s the thing that makes things taste better when you get them from a restaurant instead of making it at home – things like pork fat. I certainly didn’t have pork fat laying around. But I did have bacon. Same thing, right? So now this weren’t going to be just shrimp toast, this were going to be Bacon Shrimp Toast. Let’s just say I added more bacon to this recipe that the actual “hint” of pork fat was in the recipe I saw at first. But that’s fine by me, because the more bacon flavor the better! 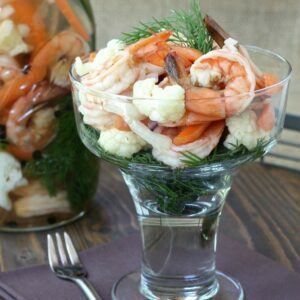 All you need to do is get the shrimp, bacon and a few other ingredients into a food processor. 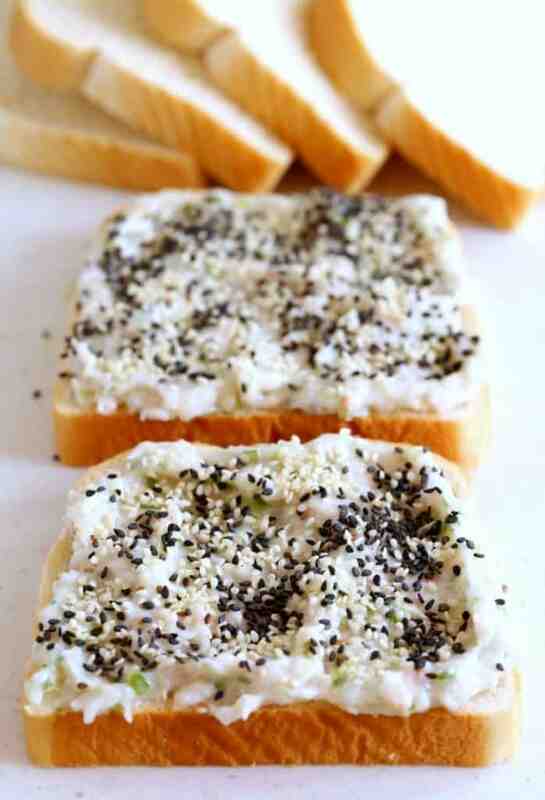 Process the mixture until it’s smooth then spread it onto thick slices of white bread and top with sesame seeds. Now it’s time to fry them up! Just a shallow fry here but get enough oil in the skillet to fry these up evenly. A couple of minutes is all it takes to get the top side nice and browned and the shrimp cooked though, then flip them over to the other side for just a minute. I’ll let you know about heating these Bacon Shrimp Toast up if you’re looking to make them ahead of time or even freezing them. That process is happening as we speak. 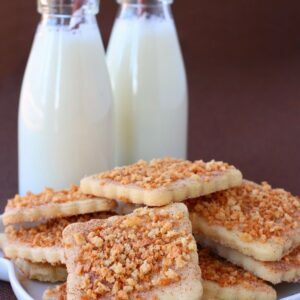 If there are any…the boys will get warmed up shrimp toast for dinner and the next random party will get frozen reheated Bacon Shrimp Toast for apps! 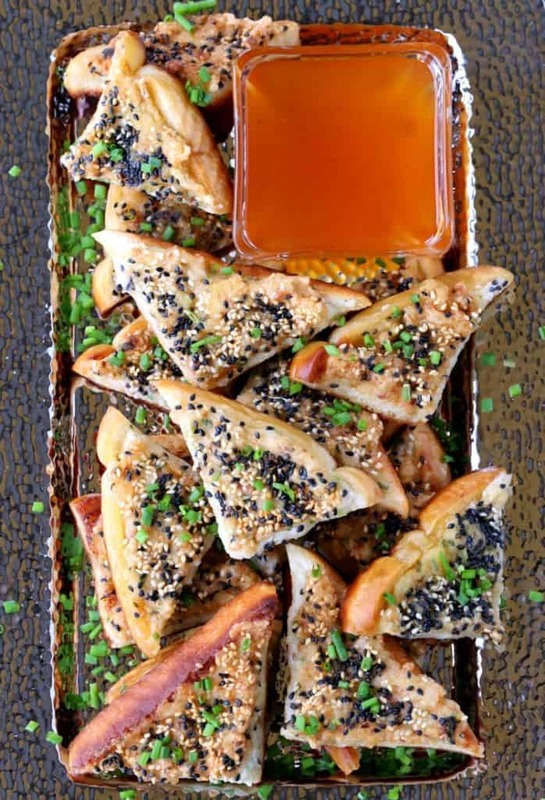 Because no one in their right mind would let any of these bacon appetizers go to waste! A delicious homemade Bacon Shrimp Toast recipe! 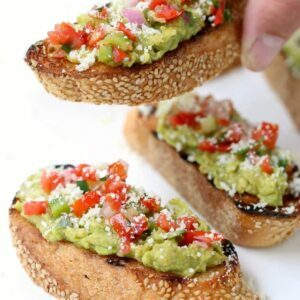 Forget take out, this tasty appetizer can be made right at home! 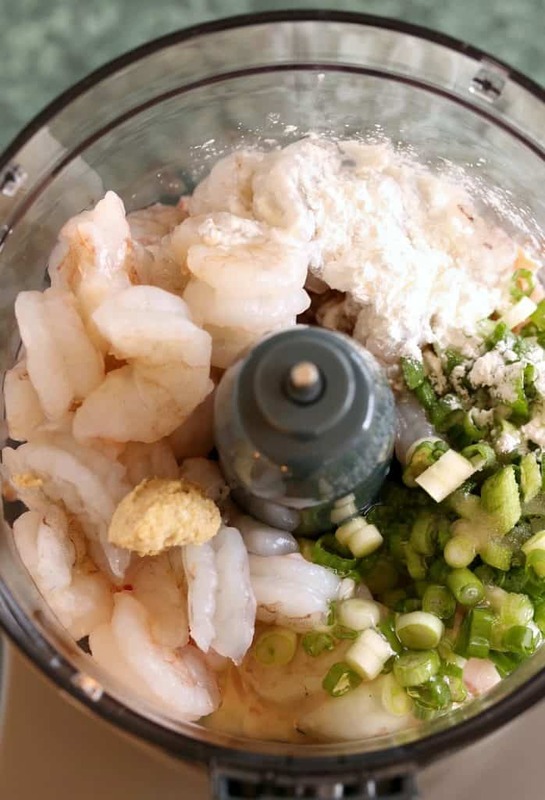 Add the shrimp, bacon, scallions, garlic, ginger, salt, sugar, cornstarch, sesame oil and egg white into the bowl of a food processor. 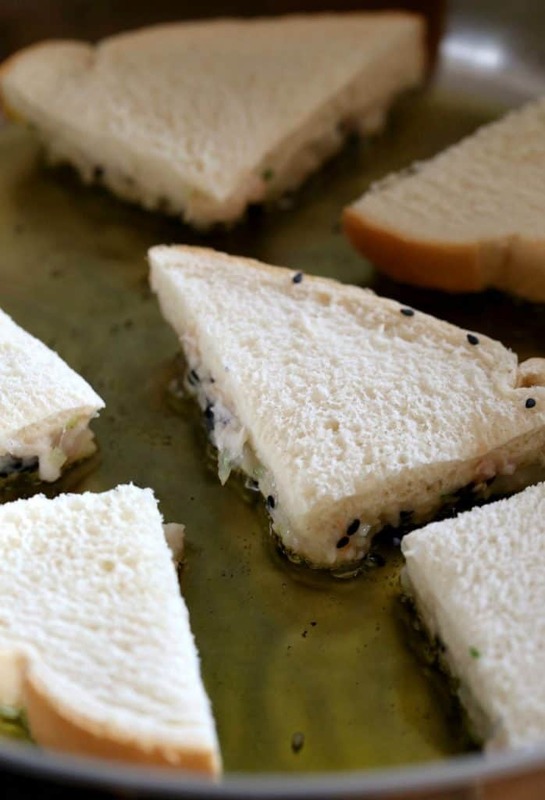 Spread 1/4 cup of the mixture onto a slice of bread in an even layer, cover with sesame seeds and cut into 4 triangles. Add enough oil to a skillet to come about 1/4 inch up from the bottom of the pan. Heat over medium heat for 2-3 minutes until hot. 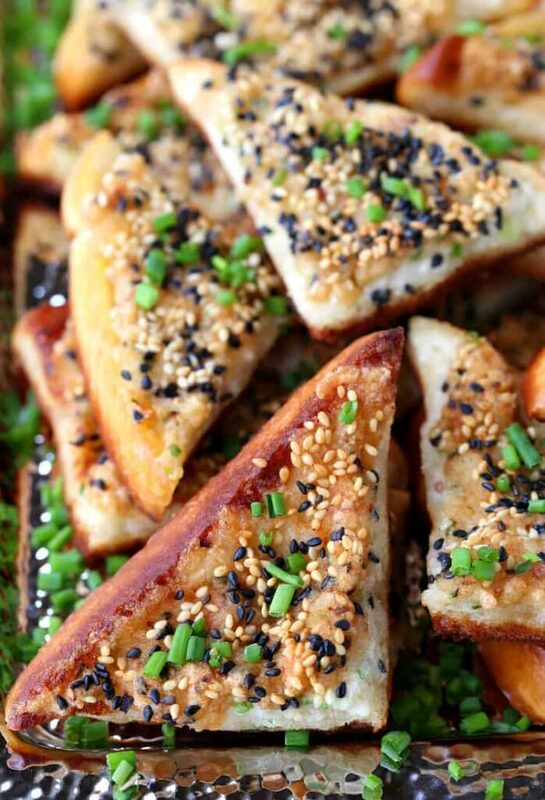 Place the shrimp toast sesame seed side down into the skillet and cook for 3 minutes. Flip to the other side and cook for one more minute being careful to watch so the bottom doesn’t burn. Remove to a paper towel lined baking sheet and repeat with the remaining shrimp toast. 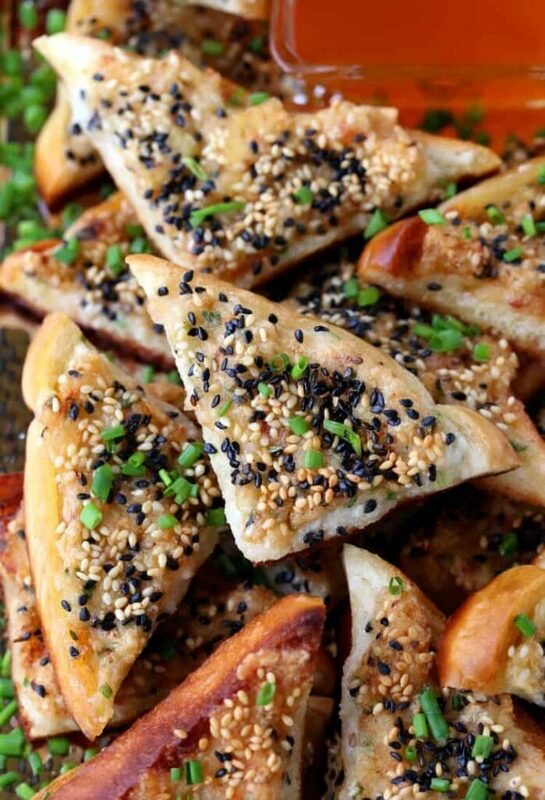 Garnish with chopped chives and serve with duck sauce for dipping.